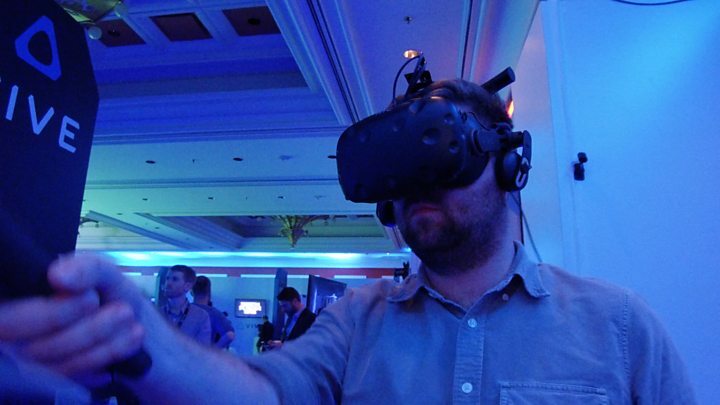 Media captionWATCH: Hands-on with HTC headsets at CES. HTC has unveiled an enhanced version of its Vive virtual reality headset at the CES tech fair in Las Vegas. The Vive Pro has two OLED screens that have a total resolution of 2880 by 1600 pixels, which is 78% more than the current model. This is designed to make graphics and text much sharper for the wearer. One analyst said it was a step in the right direction, but VR still needed more quality content to lure gamers. As well as displays that should be more crisp than before, the Vive Pro also includes high performance headphones with a built-in amplifier to offer "a heightened sense of presence" and richer sound, according to the Taiwanese firm. However, the company has not yet revealed how much the new headset will cost. The reveal coincided with news that Facebook's Oculus VR division has teamed up with China's Xiaomi. The Beijing-based handset maker will be involved in the creation of Oculus Go - a forthcoming standalone headset that will not need to be plugged into a computer, which is due for release soon. The two firms also announced they would release a version of the kit to be branded Mi VR Standalone. It will exclusively go on sale in China, where most of Facebook's services are blocked. The two firms added that both headsets would be powered by a Qualcomm processor, the Snapdragon 821. Owners of both the new and original HTC headsets will be able to use them with a wireless adapter when it becomes available later this year. HTC says it will connect either of the models to computers running a game or simulation via wi-fi, thanks to Intel's WiGig technology. Image caption VR fans will be able to try out VR experiences before they purchase them in the updated Viveport store. And the firm has also come up with a new way for virtual reality users to discover new content - 3D previews that they can try out before purchasing or subscribing. These will be available via a revamped version of the Viveport VR store. Viveport's president, Rikard Steiber told his CES audience that he expected the number of experiences available on the platform to rise from 2,000 to 3,000 by the end of 2018. "It's great to see HTC come forward and improve device specs," said Brian Blau, an analyst at Gartner. "It's something that's really needed to help users get over the hump of things like motion sickness [sometimes caused by blurring in VR headset displays]." Mr Blau told the BBC that much of the hype around virtual reality devices had meant that the technology sometimes failed to live up to people's expectations - something he believes has impacted slightly sluggish sales of VR hardware. The next generation of headsets might include even more advanced technologies like eye-tracking, which could allow ultra high resolution rendering of graphics at the exact point on the screen where users are looking. "The one thing that will change the situation though is quality content," added Mr Blau. "You could argue and say there are a lot of games out there, even businesses are adopting VR... but it's not nearly enough. "Technology ecosystems require a massive amount of content to keep people coming back, and it has to be diverse."